Back-to-school is right around the corner, and that means it’s time for health physicals, immunizations, and an equally important appointment – dental checkups. Until then, summer is the time when many kids slip out of their usual routines and perhaps even put their oral health at risk. Now is the time to zero in on your child’s oral health habits and establish the foundation for good dental hygiene in the school year ahead. Continue reading to learn how you can teach your kids the healthy habits they need to protect their teeth for life. Whether your kids like to guzzle back a sweet fizzy beverage or indulge in homemade lemonade to squelch the summer heat, drinking too much sugar could turn into a problem over time. Sugar can rapidly destroy the tooth enamel, not to mention support the proliferation of dangerous bacteria that can cause decay and infection in the teeth and gums. While water remains the healthiest source of hydration, there are ways you can combat oral health damage without eliminating sweet drinks altogether. To start, limit sugary beverage consumption to isolated times instead of letting your child sip on the drinks all throughout the day. Then, encourage your child to rinse with water or perhaps even brush with toothpaste afterward. You can also minimize sugar consumption by diluting juices and other sweet drinks with a 50-50 water to juice ratio. With no school to hurry off to each morning, the tooth brushing and flossing routine your kids may be used to each morning could fall by the wayside. We recommend making daily brushing and flossing a family activity – one that everyone participates in at the same time each morning and night. Not only does this keep dental hygiene at the forefront of your child’s mind all summer, but it can also help emphasize the value placed on a healthy mouth for life. Make sure your child is tackling every surface and brushing for at least two minutes. This includes the tongue and around the gum line. Be sure to correct any negative habits you may notice while your child is brushing. It is not uncommon for children to rush through the brushing and flossing process, cutting corners and putting the health of their teeth and gums in jeopardy. Finally, go ahead and schedule your child’s next dental exam as soon as possible. A summer visit means your child may miss less school – especially if you need to return for fillings or other oral treatments. 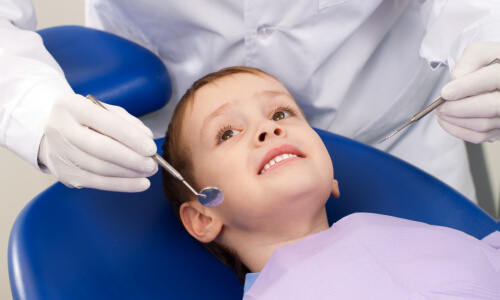 Reassure your child that going to the dentist is a positive experience and one that should not be feared. Since children learn from their parents’ habits, we also recommend scheduling your own dental checkup to set a good example for long-term oral care. If you have anxiety about visiting the dentist yourself, contact our office to schedule a tour, ask questions, and learn about anxiety relief solutions available in our office.